The Children’s Rosary offers a simple and deeply moving experience of prayer. With the innocent voices of the children, one can pray all four mysteries: Joyful, Sorrowful, Luminous and Glorious. The Rosary is led by members of the Children’s Rosary prayer group movement. Both young and old will find this a favorite way to pray the Rosary. Special highlights include the Children’s Rosary theme song, Rosary Children, featuring little ones from around the world in their Children’s Rosary prayer groups. This video provides a glimpse into a Children’s Rosary prayer group and a window into the hope and joy which represents our future. Bonus Features include instructional videos with step by step explanations of How to Start a Children’s Rosary Prayer Group and demonstrations on How to Run Your First Children’s Rosary Group Meeting. Frequently asked Questions are also answered by Blythe Kaufman, founder of the Children’s Rosary. 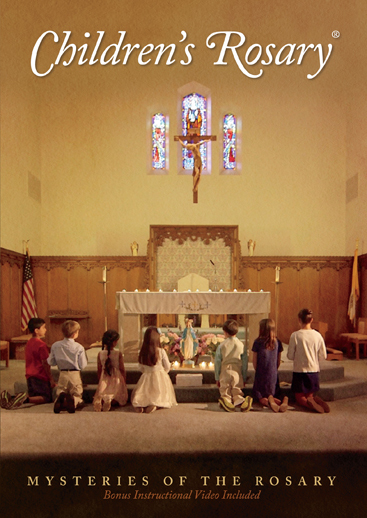 *Please note the Children’s Rosary DVD is carried in many book and gift shops. Please contact your local gift shop to see if they carry a copy. Bookstores interested in carrying our materials please contact us at info@childrensrosary.org or (860) 785 – 3340. *We encourage those interested in purchasing large quantities of our materials to contact us at info@childrensrosary.org or (860) 785 – 3340. *The Children’s Rosary DVD is a Region 0 DVD otherwise known as “all region”. Therefore it will play universally on computers and DVD players throughout the world.